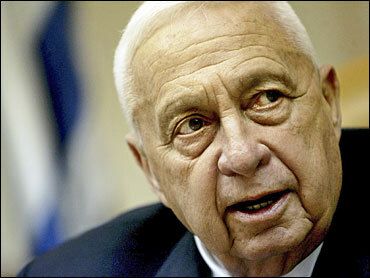 Former Israeli Prime Minister Ariel Sharon was rushed to the intensive care unit of a Tel Aviv hospital Wednesday to undergo a form of kidney dialysis, a hospital spokeswoman said. Sharon's condition had deteriorated significantly earlier in the week, when officials at the Sheba Medical Center announced the former leader's kidneys were failing and that they had noticed changes in his brain membrane. Sharon, 78, has been in a coma since suffering a massive stroke on Jan. 4. Sharon's blood will be filtered to remove excess fluids that have been accumulating in his body as a result of the kidney failure, the hospital said. He is also receiving antibiotics intravenously to treat a bacterial infection in his blood. Hospital spokeswoman Anat Dolev declined to answer further questions. Dr. John Martin, a professor of cardiovascular medicine at London's University College, said the infection in Sharon's blood indicates his immune system is weak, and the problem could damage other vital organs, such as the liver. Normally, doctors do not treat patients in Sharon's condition, Martin said. However, the dialysis and antibiotics could keep Sharon alive for weeks or even months, he said. "The best thing might be to allow Ariel Sharon to die by not doing this kidney dialysis and that is considered ethical throughout the world," Martin said. Dr. Philip Stieg, director of the department of neurosurgery at Weill Cornell/NY Presbyterian Hospital, said the kidney failure combined with the infection in his blood increase the chance Sharon will contract pneumonia, a common killer in people of his age and in his condition. At the moment, Stieg said, Sharon is suffering "multi-system failure" and "it just becomes a snowball that just keeps getting bigger." "It's obvious that they're doing everything to keep him alive. It's not clear why," Stieg added.